I'm indebted to Mark Collins for a little trip down memory lane yesterday, with his reference to this article in the Washington Post. It's about a community on the Quebec-Vermont boundary, and the changes that have been occurring since the US has ramped up its security at the formerly longest undefended border in the world. 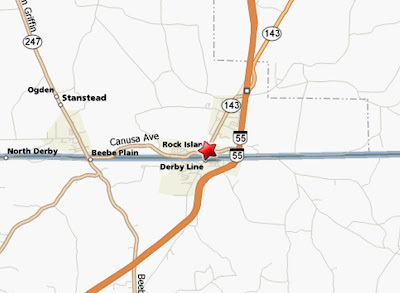 Derby Line (and other places with their own names that form part of that border community--Beebe, Rock Island, Stanstead) is not the only place affected. Fortress America has made golf in Ft. Fairfield, for example, a risky and sometimes technically illegal recreation. When I step out of my door-yard, I am in Canada. If that road is closed I can't get out of there ... If you block the road off I can't get out and the fire and ambulance can't get in. It's very important I get down to the liquor store once in a while. As it happens, I know the Derby Line area well. My grandparents lived in Stanstead, and I had relatives in Rock Island. The "old factory" mentioned in the Washington Post belonged to my uncle until he relocated the business (work clothing under the "Goodhue" label) to Sherbrooke in the early 1960s. Across the street was a border marker: my grandfather once had me stand at it, with one foot in the US and the other foot in Canada. A local library still has its check-out in Canada and its books in the US. There was effectively one community here, and Customs traditionally operated with a light touch. As the map above indicates, if not very well, Highway 143 from the Laurentians takes a slight swing into the US at Beebe--just a few hundred feet at the most--and then connects to the 247. Traditionally, drivers to Stanstead from the Quebec side simply waved at the customs officer at the Beebe border crossing without stopping. There was an honour system in operation: cross-border shoppers were expected to stop, declare their purchases and pay the appropriate tax, and they did. But this wasn't always the case. A new Canadian customs officer took over when I was a child, and quickly made himself unpopular. He insisted on charging duty on the most insignificant purchases, and was generally officious and unpleasant. Matters came to a head one evening when he refused to allow some ladies from the US side to bring their baked goods to a church supper on the Canadian side. As I recall, he didn't stay in his position too much longer after that. Local citizens always look for commonsense solutions, and now they're grappling with a world that "changed after 9/11." Town meetings are being held. Ideas for making things bearable are being discussed. Officialdom, for its part, is talking about fences and checkpoints. "They're stirring up a little hate and discontent with that deal," said a woman who grew up in the area. "It's like putting up a barrier. We've all intermingled for years." But Border Patrol chief Joseph Mellia, we are told, "prides himself on seeing the world in black and white." And for Derby Line residents, what he sees is what they get. UPDATE: Commenter Brian Mc raises a disturbing case of US overreaction. This page contains a single entry by Dr. Dawg published on August 26, 2008 9:00 AM. Jena Six update was the previous entry in this blog. Signs is the next entry in this blog.